Caters for beams with various end supports and with arbitrary loadings composed of any mix of point loads, moments, and distributed loads. Beam properties may be entered numerically or by simply tapping and dragging, with an extensive multi-national section library built-in, plus a section generator for custom-sized cross-sections of common shapes. There is an emphasis on quick and precise input of high-resolution data through graphical drag-and-tap interaction, with numeric input available as an alternative. Instantly available, clear graphical representations of deflections and force envelopes, with smooth curves and sharp discontinuities, are interactive with slider bars for reading off results at any point along the beam, together with single-tap access to maxima/minima and other points of interest. Loads can consist of any combination of point loads, couples, UDLs, and trapezoidal distributed loads at any points along the span. Distributed loads can be assymetrical and of any length along the span. A single-tap is all that is needed to change the end support conditions to quickly switch between fully fixed, fixed/pinned, simply supported, and cantilevers. Dimensional resolutions to 0.01m (0.5” with imperial units). Beam lengths from 0.2 m to 40 m (6” ~ 1600”). Loads from 0 kN to 1000 kN (0 kips ~ 200 kips). Arbitrary combined loadings of point, couple, and trapezoidal loads. Fixed and pinned at opposite ends. Results at any position along the beam. Local and global maxima & minima. Geometry: for entering beam length, supports, and section properties. Loading: for adding, removing, and editing loads. Utilities: for selecting unit system (metric/imperial) and resetting the model. Precision of positioning with finger as high as 1 part in 2000. Drag slider for beam span. Tap to add a load to the beam. Drag a load to the wastebin to remove it. Tap on points of interest for specific results (e.g. maxima/minima). Double-tap on an input variable to enter its value numerically instead of graphically. Tap on button in geometry window to open library. Tap on category (e.g. British UB). Diagram and properties will appear; tap on a Use button to pick major or minor axis. Diagram and properties will appear; double-tap on a dimension to edit it. Choose a material (optional) by tapping on the blue button. 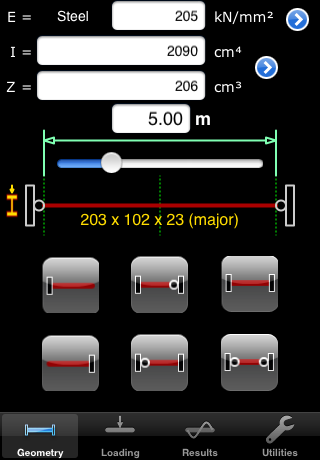 Tap on the Use buttons to pick either major or minor axis. Increased number of decimal places for some US units. Updates to section library and custom generator. Added American MC, L, and S sections. Fixed a bug in the solid rectangular section generator. Improved picking of coincident loads. Added larger Australian SHS & RHS sections. Specification upgrade and additional features. Maximum beam length increased to 40 m (metric) or 1600" (imperial). A reset button is provided for clearing all of the model data. American sections renamed to American format. The section generator now includes dedicated solid oval and rectangular bars for convenience. This is a recommended update for all users of imperial units. Fixes a bug relating to incorrect imperial units being used for distributed loads. They have been corrected to kip/ft. For consistency, all moment forces have been changed to kip-ft, and for clarity units are displayed while editing distributed loads. Update to section library and custom generator. Important update for all users of imperial units.